There are a couple of men's models that used ladies watch movements, the earliest being the 1936 Norfolk. But there is only one woman's model that used a man's movement. In fact, I think the record for the model with the longest production run is the same woman's model... the 1948 Chatelaine. It was produced for an uninterrupted 15 years and produced through through 1963. 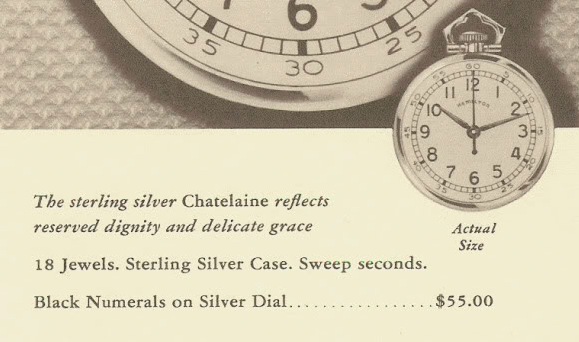 Originally the Chatelaine was produced with a 17 jewel 987S movement, left over from WWII production. The case was rhodium plated sterling silver. Rhodium is a precious metal, silver in color, and more precious than gold. The black numeral dial should look familiar - it's similar in pattern to the men's Secometer model, although the orientation is different with the stem at 12:00. The following year the Chatelaine was given the newly introduced 18 jewel 748 movement. The case also lost the rhodium plating and was simply sterling silver from 1949 on. The Chatelaine was meant to be worn, either as a necklace or a broach. 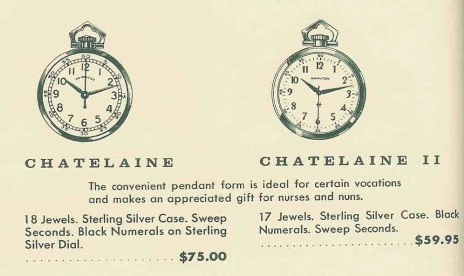 The model was specifically advertised for "Nurses and Nuns" and I've seen many Chatelaine examples that were engraved as presentations for school sisters of various orders. 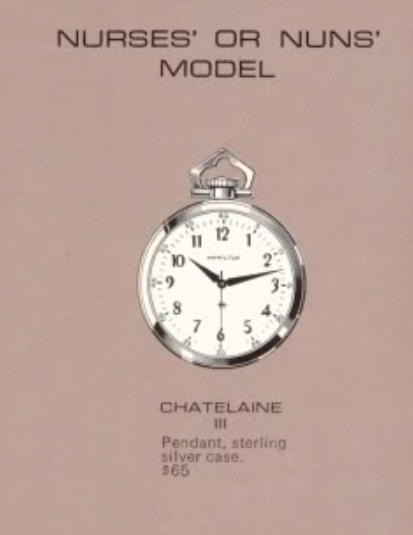 In 1961, the Chatelaine II joined the Chatelaine in the model line up. The "II" model is very similar to the original with the exception being it utilized a 17 jewel Swiss-made movement instead of the 18 jewel 735 American-made grade then in production. The two watches were produced together through 1963, after which only the Chatelaine II was available. Finally, in 1968 and 1969, the Chatelaine II was replaced by the Chatelaine III with yet another Swiss-made grade. The one constancy through all three models is the sterling silver case. 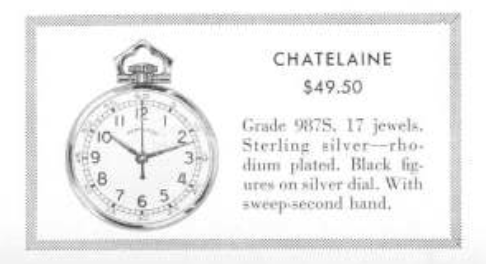 I find it interesting that the Chatelaine didn't receive a B-model designation when the movement changed from 987S to 748 and then to the 735. B models usually mark a change in movement calibre but perhaps the 987S to 748 preceded the practice of using a B to denote a change. Plus, the 748 and 735 are largely considered identical other than the balance jeweling - so that may not have been a big enough change to warrant a B. In any event, 15 years of production is a record rivaled only perhaps by the Boulton. The Boulton was introduced in 1940 and produced through 1954 - a long production run for sure - but it was interrupted by WWII so the record really belongs to the Chatelaine. I recently picked up a Chatelaine since the price was right and it was an opportunity to show it on my blog. They're wonderful watches and make great gifts, in my opinion. As received, my example is probably from the late 1950's or early 1960's - as it has a 735 movement. From the outside, there are no obvious differences between the models - although the 987S has a little less silver since the movement is slightly larger. The case is a three-piece design - making it also the last Hamilton model to use a three-piece case (if you exclude models with purely decorative bezels that can pop off). The Chatelaine has a case back and a front bezel that snap onto the case center. The 735 is an upgraded version of the 748. It's interesting to note that originally the 748 had a one-piece barrel bridge - so you had to take the watch apart to get to the mainspring, in the event that it broke. Within a couple of years, Hamilton changed the 748 and added a two-piece barrel bridge - so you could remove the portion that covered the mainspring barrel, without having to remove the train bridge. I'm sure that was a huge timesaver for watchmakers. The two-piece bridge design was carried over to the 735 movement when it replaced the 748 in 1955. Eventually, however, Hamilton went back to the one-piece bridge design for some reason. I guess the advent of "unbreakable" white alloy mainsprings meant the added cost of a two-piece bridge was no longer necessary. If you want to see the two-piece design, compare the photo below with the 735 in my recent Guardsman III post. Without the bezel in place, the movement and dial will come out the front as soon as I remove the crown and stem. Sterling silver was used in a number of watch cases but not too often. The Chatelaine is definitely the most commonly found silver model, that's for sure. The movement is completely disassembled and cleaned. Once everything is dry, it can be reassembled with fresh lubrication. A slight tweak to the regulator slows the watch down until the two lines approach horizontal, representing 18,000 beats per hour or 5 ticks per second. The reassembled movement gets the dial and hands reinstalled and then everything is tucked back into the case. The sides of the crystal give the watch a little of a gold-fish bowl effect so you can't see the seconds markers on the outside of the dial from straight on. The dial can be installed with the 12 up or down so you could orient it with the 6 at the stem and thus make it easier to read if it was hanging from your neck. The 12-up is the traditional orientation of the dial though. The bow swivels 360 degrees so if you installed it on a chain it would still lay flat. Hi, do you know what these watch's are worth? I have a chatelaine. I inherited it from my late mother who was a nurse. It is a 748 with 18 jewels. Sterling silver back and overall in pretty great shape. Thank you.. I've seen them sell for as little as $25 and as much as $200. Really depends on condition. If one wanted to transfer this into a traditional watch case could the dial be rotated so the stem is at the 3? Nope - on this movement you could swap it around so the crown is at the 6 position but you can't rotate it 90 degrees. do you know a source for replacement crystals for this watch?